The SaverNation Program is being recognized as the first truly revolutionary innovation for retirement savings in decades. It was invented and built by independent experts from a variety of fields. It’s been made possible because of an unprecedented cooperative effort from leading benefits, payroll, and retail businesses, and support from key government officials and nonprofit groups. Cash Back from Every Purchase: Buy what you’re already buying from leading merchants at the same prices and save automatically. Save Using Other People’s Money: With SaverNation, you save more without having less to spend. Your favorite online merchants give you the cash. 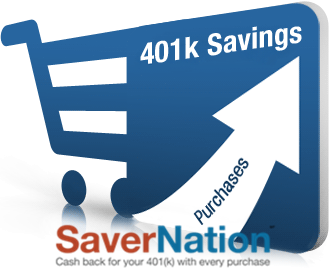 Flexible Saving Options: SaverNation cash back will be automatically deposited to your 401k, 403b, 457, Roth IRA, IRA, or other retirement account. It’ll change your life—if you use it. If you don’t want to sacrifice more money today to save more for tomorrow, you’re not alone. Roughly 75% of employees say they don’t save more for retirement because they can’t afford it. Imagine how you’ll feel, every day, when you go about making your normal purchases, and after each one, the seller thanks you with a contribution for your retirement savings. EXCEPT, it’s even better than that. Imagine the satisfaction and peace of mind of making a purchase and knowing you got the item you bought, plus money for retirement, PLUS more spending money for you to use now. That’s what will happen. Special thanks goes to the American Payroll Association and the thousands of payroll professionals they represent. Payroll staffs are responsible for making sure that every employee gets a perfectly accurate paycheck, on time, every time. It’s a lot of pressure to be perfect, but when we have a job, it’s what we all expect. The APA endorses the SaverNation program and encourages employers to offer this exciting new benefit.